Guatemalan President announces he had given instructions to move the country’s embassy in Israel from Tel Aviv to Jerusalem. 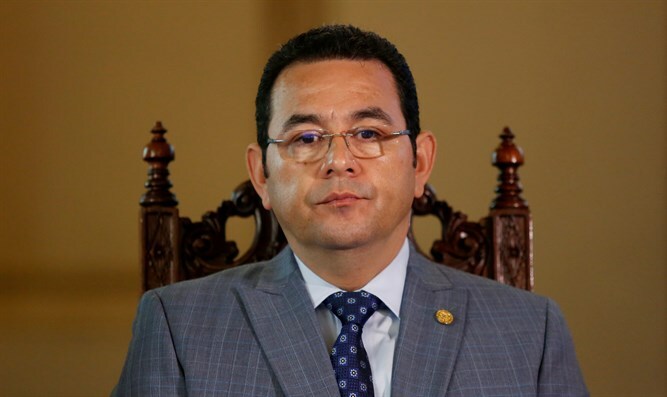 Guatemalan President Jimmy Morales announced on Sunday night he had given instructions to move the country’s embassy in Israel to Jerusalem, Reuters reported. In a short post on his official Facebook account, Morales said he decided to move the embassy from Tel Aviv after talking to Prime Minister Binyamin Netanyahu about the issue. Morales’s announcement follows U.S. President Donald Trump’s recent recognition of Jerusalem as the capital of Israel. At the time, Trump also announced he had instructed the State Department to begin the process of moving the U.S. embassy from Tel Aviv to Jerusalem, a process which is expected to take several years. Trump’s move was met with anger in the world, particularly among Arab states. Last Thursday, 128 countries backed a non-binding UN General Assembly resolution calling for the United States to drop its recognition of Jerusalem. Guatemala was one of only a handful of countries to join the United States and Israel in voting against the resolution, noted Reuters. Over the weekend, the leader of Romania’s ruling Social Democratic Party, Liviu Dragnea, said the country should “seriously consider” moving the Romanian embassy in Israel to Jerusalem for practical reasons. “All Israel’s central institutions are in Jerusalem, and ambassadors and embassy staff commute from Tel Aviv to Jerusalem,” Dragnea said. Romania was one of 35 countries that abstained from voting on the UN resolution on Thursday. Despite Dragnea’s comments, there have been no indications to this point that Romania was seeking to implement such a move.